I am grateful for my dad. This weekend my girls and I saw the Disneynature movie Chimpanzee. 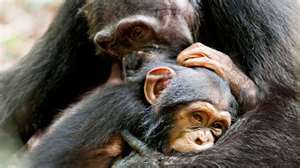 It is a documentary on the beginnings of a baby chimpanzee named Oscar, deep in the tropical rain forests of Africa. The story starts out as Oscar begins chimpanzee “preschool” with his mom learning how to find food, use tools and bond with other chimpanzees through grooming. Towards the middle of the movie Oscar’s mother is killed and he is left bewildered on what happened to her. He searches for her, tries to find food, tries to remember what she has taught him but he begins to lose weight and lose grasp of his happy life that he once had among his tribe of chimpanzees. The other mothers and young were hostile towards him now that he didn’t have a mother to protect him. It looked bleak for Oscar. There was one last chimpazee that Oscar hadn’t asked for help and that was the alpha male and head of the tribe. The most unlikely chimpanzee as he had never paid any attention to the young, his job was to protect the territory and his members. He was good at it. Oscar started to follow him around and copy everything he did from opening nuts to scanning his fur for bugs. The alpha male took notice and started to give him food and allow him to snuggle close. By the end of the movie little Oscar rode atop of this giant alpha male’s back just as he had with his mother. Oscar was going to be fine. My mother left us when I was four and my brother just one year old. There were several stepmothers who should have taken me under their wing to show me how the world worked, how to make friends, bond with others and how to be in a family but somehow couldn’t. I can remember following my dad everywhere, watching his every move. He was very young himself, only 25 years old at the time but seemed to be far more adept at caring and bonding with his children than our mother ever could have. My dad was dependable, consistent, and resourceful. He was not perfect but he showed up. Everyday. Like Oscar, I didn’t get the millions of moments of love that only a mother can fulfill BUT I did fully experience all the millions of moments that only dads can give. Luckily, I have a very keen ability to watch and learn as well as an innate curiosity of life. I have filled many of those cracks that were started when my mother left by watching others, reading, experiencing life, relationships with family and friends and most importantly by being a mom to my three girls. God has filled my life with a wonderful husband, three beautiful girls and a dad. I am going to be fine. I am very grateful for my dad.